As a trusted leader of radiant floor heating solutions, ProLine offers a wide variety of proven radiant heat systems that can be installed under virtually any type of flooring. From small custom projects to large commercial applications, ProLine has the products and professional design capabilities to provide you with the best, most complete solution on the market. ProLine TileHeat floor heating systems are the top radiant floor heating systems on the market. In addition to the premium quality and low prices, ProLine also provides comprehensive system engineering and design services. Our radiant heated floors also feature an industry leading warranty and can be effectively installed under virtually all floor surfaces, including tile, marble, slate, laminates and hardwood. Heated floors are simply a smart, efficient way to heat your home. As the name implies, heated floors radiate heat from the floor up, keeping you warm and comfortable from head to toe during the cold winter months. Radiant heated floors are an economical way to heat homes and boost equity. Electric radiant heat is provided by electric under floor heating cable. The system relies on a network of cables installed beneath the surface of the floor controlled by a thermostat that coordinates with sensors to keep floors at optimum temperature. Each room, or zone, can be controlled separately by its own thermostat, making radiant floor heating systems a very efficient and customizable way to maintain warmth in your home. Generally, electric radiant floor heating systems are the most practical, flexible choice for most floor heating projects. Electric radiant floor heating systems are relatively inexpensive to install, easily customizable and require no maintenance. How do Heated Floor Systems Work? There are three main components both hydronic and electric radiant heated floor systems share: a heating element (electric resistance cable, or PEX cable for hydronic systems), a contactor/control center and an activation device (thermostat, timer, etc.). Featuring electric resistance heat cables, electric radiant heat systems can heat a surface in 30 to 60 minutes. In order to heat the same floor, hydronic radiant heating systems use a boiler to first heat the water, then pump it through the PEX cable, heating the same area in anywhere from 4-7 hours, a considerable difference in performance. Warm feet are a big reason for installing heated floors, especially if you have a lot of hardwood or ceramic tile in your home. Heating from the floor up is a great way to control cold drafts at floor level. Efficiency is another great reason to install a heated floor. Unlike forced air systems, radiant heated floor systems are room specific. With the help of sensors and a programmable thermostat you can opt to heat one room, or several, depending upon your needs, and realize considerable savings on your monthly gas bill. ProLine Prodeso floor heating systems feature an innovative uncoupling and waterproofing membrane system for heating floors and other surfaces without movement or expansion joints in the screed. The membrane is laid out directly over the subfloor and then heat cable is placed in the channels of the membrane. Tile or other flooring can then be placed directly over the membrane. The membrane can dramatically reduce installation time. 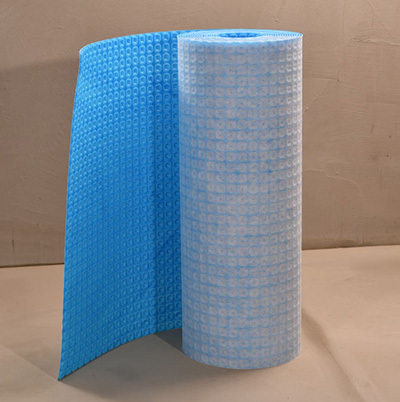 And the Prodeso membrane is safe under all conditions and weather (for outdoor applications) and can be used to heat a wide variety of floor surfaces. It even waterproofs the substrate in the case of overlaying on cracked or imperfectly cured floors with a risk of vapor stress. Low thermal inertia. Tiles are installed directly on top of the heating cable. 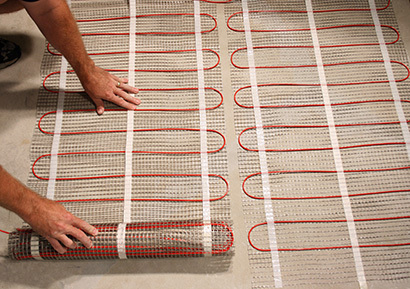 ProLine FoilHeat floor heating systems feature a unique, highly efficient construction. The FoilHeat cut-and-turn floor heating mat is designed for use under carpet, laminate, engineered wood and other floating floors. The FoilHeat mats can be cut and shaped on site to meet the specific requirements of the project. (NOTE: Cut the mat foil only. Do not cut or damage the heating cable in the mat.) The efficient floor heating system can be used to heat any size or shape room, from basements to bedrooms, offices, etc. Installs between the insulation pad and the floor. Virtually no floor buildup, and no thin-set is required. 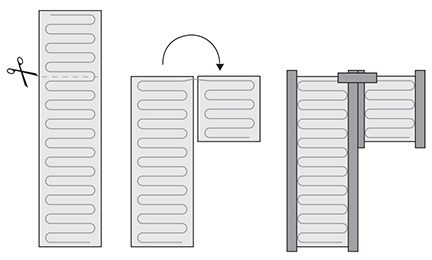 Aluminum construction is lightweight and distributes heat quickly and evenly. Watertight. Heated carpet floors can be steam cleaned. 12 watts per square foot (or 41 BTUs per square foot). FoilHeat is an ultra thin electric radiant floor heating system primarily for use under laminate, engineered wood, glued hardwood and other floating floors. The principle advantages of using FoilHeat include ease of installation, rapid response time, and uniform heating of your laminate flooring. The special materials used makes it free from problems of ‘Hot-Spots’ or localized heating. Electric radiant floor heating systems, such as TileHeat and FoilHeat, are usually the most practical, flexible choice for most residential floor heating projects. Electric radiant floor heating systems are relatively inexpensive to install, easily customizable and require no maintenance. FoilHeat system is made with fluoropolymer insulated heating cables that are sandwiched between two layers of specially reinforced aluminum foil. 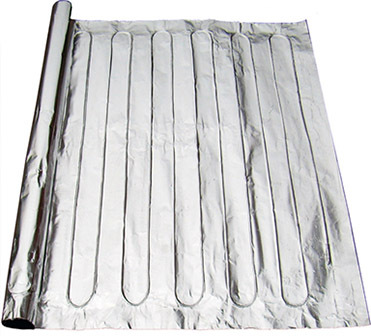 The uniform spacing of the heating elements, further backed by the aluminum foil, ensures even heat distribution. The heating element is connected to a power-supply cable, which exits the laminate mat from one corner. The power lead is a flat thin two core flexible cord, consisting of two insulated conductors with a metal sheath and an outer sheath. Depending on your heating requirement, FoilHeat is available in 120 and 240 volts at 12 watts per square foot. Mats are available in predetermined lengths with cold tail – prefabricated and tested in a carefully controlled factory environment. Radiant floor melting systems are only as good as their installation. When you work with ProLine, you're assured of receiving the system design and techinical support you need for a successful installation. You can also receive free installation training from ProLine. Call a ProLine radiant heat expert today at 866.676.9276 to learn more.